There’s something about the helpless awkwardness of growing up that guarantees the enduring appeal of magic. 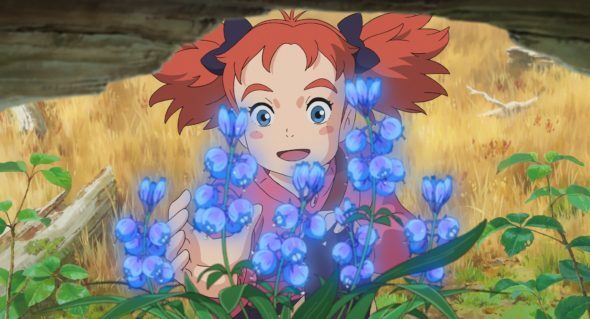 Mary and the Witch’s Flower taps into that spirit with appealing grace. And it’s a promising first feature from Studio Ponoc, home to a Studio Ghibli diaspora that formed after the venerable Japanese animation studio announced a production break back in 2014. When a walk in the woods leads to a chance encounter with special flowers, Mary (voiced by Ruby Barnhill in the English language version) gains temporary magical powers. Her broomstick whisks her away to the magical college Endor, which looks about like if Hogwarts put down stakes in Spirited Away. Mistaken for a witch and propped up by the magical flowers (apparently the PEDs of the wizarding world), Mary is deemed a prodigy by the excited school faculty. She soon learns she’s not the only one interested in those flowers, and outsider or not it will be up to her to save magic for everyone. Director Hiromasa Yonebayashi, Ghibli veteran and Oscar nominee for When Marnie Was There, keeps the visual charm turned up throughout the film—a good thing, given that his script (co-written by Riko Sakaguchi and based on a children’s novel by Mary Stewart) lacks the heft of a typical Ghibli film. For adult viewers, Yonebayashi’s light touch can be a bit too light. Mary, with her wild hair and strong will, is a charming stand-in for kids, but her hero’s journey will be instantly familiar. Endor professors Madam Mumblechook and Doctor Dee (Kate Winslet and Jim Broadbent) exude sinister charm, but the rest of the sparse supporting roles don’t have much to add beyond perfunctory plot points. These are minor complaints though. And the animation, especially the magical set pieces that test Mary’s mettle, makes up the difference. The film offers up a fully-formed magical world with smart visual economy over exposition (cough Fantastic Beasts cough). Mary’s determination is contagious, and even if her saving the day is inevitable it’s impossible not to feel moved by the choices she makes to get there. For all the magic that infuses Endor, Doctor Dee was on the right track when he told Mary that electricity is just another form of magic. If Mary and the Witch’s Flower doesn’t always have the preternatural spirit that animates the best of Studio Ghibli, it’s a delightful visual successor even when it’s working a little harder to keep the spark alive.